The most recent state legislative session was a mess, with lawmakers failing to act to repair Minnesota’s crumbling transportation infrastructure or make jobs-creating investments in transit and public works. Electing legislators who will put the state’s working families first is a top priority for labor this year, and the St. Paul Regional Labor Federation will kick of Labor 2016 by co-hosting a campaign school July 26 for union members, retirees and other labor supporters. The free, daylong training, co-hosted by the Minneapolis Regional Labor Federation and the Minnesota AFL-CIO, will take place at the Minnesota Nurses Association headquarters, 345 Randolph Ave., St. Paul. 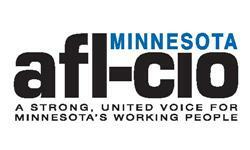 Registration is required and open at www.mnaflcio.org. A focus of the campaign schools this year, Minnesota AFL-CIO Member Development Director Bethany Winkels said, will be preparing labor volunteers for longer, more nuanced conversations with likely voters. The campaign school also will cover the landscape of the 2016 elections, with a focus on winning back a working-family majority in the Minnesota House and maintaining a majority in the Senate. Trainers also will preview tightly contested congressional races in the 2nd District, where labor-endorsed Angela Craig is seeking an open seat, and in the 8th District, where Rep. Rick Nolan is labor endorsed for re-election. “We’ll deconstruct how politics really affects people’s lives, how what happens at the Capitol impacts you in St. Paul or in Willmar or in Albert Lea,” Winkels said. Campaign schools also will take place in Alexandria, Duluth and Rochester. For more information, contact Winkels at bwinkels@mnaflcio.org or 320-296-5853.